The annual national championships in South Africa were held at the end of April and myself, Lee Persse and Micheen “Mouse” Thornycroft took part together as part of a team; we went on to win three gold medals, have a great experience, and spend a weekend filled with lots of laughter. Lee’s former pair partner from the Rio Olympic Games, Kate Christowitz, had organised a number of races for retired Olympians in order to bring both experienced and new rowers together and race as part of the Old Ed’s Rowing Club. We managed to find time for two training rows together before the regatta and that was it! All three of us are coaches at different schools and clubs, and we were all very busy, running around between our races to get kids ready and on the water for their events. We raced in the eight (8+) alongside school girls who are aspiring to row for South Africa. Lee said: “It was great to race with these youngsters and see their passion and excitement for the sport!” We took gold in the Woman’s eight category and hit some decent speeds. We raced in the eight (8+) alongside school girls who are aspiring to row for South Africa, and took the gold! The three of us, along with Kate, then raced the Quad (4x) and Four (4- ). The Quad is always a fun boat class with lots of speed, and we thoroughly enjoyed racing it. We also took first place in this race. For all three of us the most amazing part of racing again wasn’t the wins or the medals we walked away with, but the feeling of being back on the water, having a laugh, and being reminded why we love the sport so much. As for me, I got to know these girls much better and improved on my sweep rowing skills as we did our warm-ups. There were lots of jokes being cracked and lots of giggling from the bow seat (Mouse!). It was sometimes hard to keep focus and not start giggling, as Mouse’s laugh is ridiculously contagious. But the jokes were put aside a soon as the oars were placed and the flag dropped to get the race going. It seems that the competitiveness of an athlete that has been to the Olympic Games is something that is always present. The will to win is still there, even though this was only a fun race – very different from an Olympic Final. This desire to succeed made me realise how lucky and honoured I was to be in the same boat as these exceptional and inspiring women. I had so much fun; the single can be a very lonely boat to compete in, and a change in routine is always welcome, especially if you get to line up with very talented oarswomen. 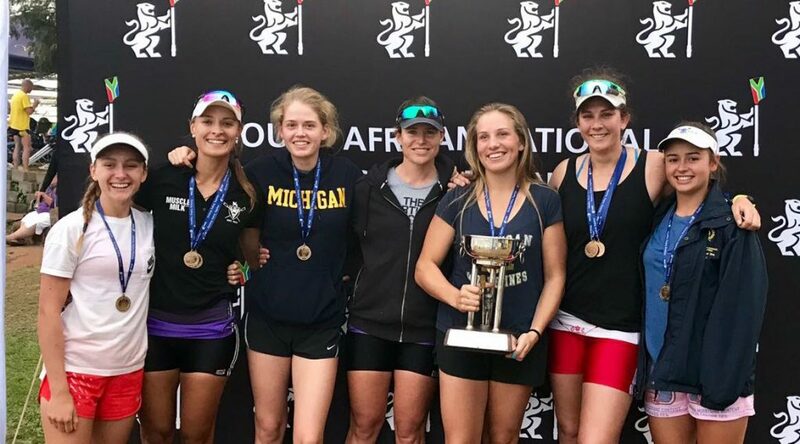 After a great weekend of racing we look ahead and would like to see this to become more of a tradition, to team up old and young athletes together, and have some fun at the same time as delivering some quality racing in South African women’s rowing!